Exceptional Servicesubmitted by Sean S. - Mar 25, 2019 |Recommended: YesThe team has prompted me with more than enough information to assist me in my decision making process. Overall Goodsubmitted by Christina D. - Jan 03, 2019 |Recommended: YesThere are a couple things that I get upset about 1 sometimes it sounds as though there are elephants above me. They are extremely loud at times and don't feel like very considerate of who is below. 2 Snow removal is not good. Last year when we had a snow storm, people had to park on the street b c spaces were not clean and they came through once and that was it. And then I got blocked in and had to shovel my space out. If you had a spot in one of the garages forget it b c you as well had to shovel out. 3 Lastly, I have had several packages get returned to the sender b c they could not get into my building to deliver my package. Packages have been left outside b c of this as well. Feel like there has to be a better system or way to deliver packages. 4 I have lived here for almost 5 years and every year my rent goes up. With that being said, the premises are always kept up and clean. Inside buildings are kept up. The couple maintenance issues I had they were addressed promptly. Staff in the front office have always been great and understanding. I think that the property is very peaceful.submitted by Darius H. - Sep 29, 2018 |Recommended: YesIt is a great place for families and it is very quiet. Apartment needs to Update their appliancessubmitted by Esther A. - Sep 21, 2018 |Recommended: YesI've lived here since 2016 and I honestly love it. It has everything I need, available parking, affordable garage for the winter, and they are pet-friendly to all types of dog. I especially love it for its quietness and very family friendly environment. Its very quiet and cozy love it and the staffsubmitted by Alliallia B. - Jan 31, 2017 |Recommended: YesI love it here I can get a peace of mind.. 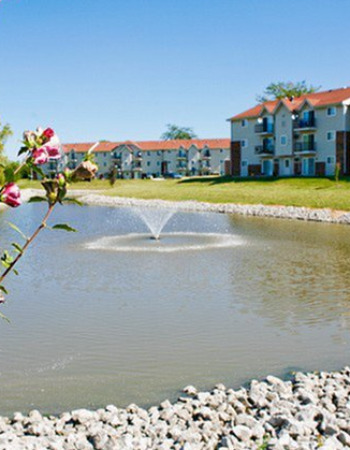 Very Nice community, nice neighbors, diversesubmitted by Debra R. - Sep 10, 2015 |Recommended: YesNice community, nice atmosphere, friendly people, work out room is nice. A few things need to be tweaked but they are not deal breakers. Awesome Staff Well Maintained Location Peace 5 Stars submitted by Kenneth E. - Jan 07, 2015 |Recommended: YesI absolutely love, love living here and wouldn t move anytime soon, this going into my 9th year following my December anniversary in 2014. You couldn t ask for better management, and staff everyone is so helpful, down to earth and family friendly on site. Well kept property with excellent amenities at your finger tips. I feel safe living here, and as far as having some on site entertainment for family or individuals, the staff make it so much fun to live here. They are always hosting community friendly events, everything from hosting a summer party for the residents with some of the best catered food around, to a fall chili cook off which is fun and belly pleasing to a Christmas decorating contest, each event is loaded with both fun and prizes, where else can you reside and have staff members treat you like family..... This is a wonderful place to reside and is also pet friendly and from my experience neighbor friendly as well. I highly recommend you take a look at this location, whether you are single or raising a family, I m sure you too will find it to be very pleasing from the moment you meet with the staff at the front office you will feel the warmth, sincerity and know right off the back, you re respected and treated like a worthy being. Lastly the location is pretty awesome as well, you name it, likely it is with in a few miles driving distance. Happy New Years to the Best Staff around, thanks for making my life feel at ease while residing here, and thanks for making us feel so very welcomed. Absolutely LOVE it here. So glad we live here.submitted by Anonymous - Apr 18, 2014 |Recommended: YesI live here with my husband, and toddler son. We absolutely LOVE it here. The staff is beyond amazing, remembers us by name..we aren't just another renter. We love the space, and all of our neighbors. We don't have a single complaint. If we didn't have a growing family we would stay much much longer.